The emergence of new illegal drugs markets initiates a vicious cycle that results in more institutionalised corruption. 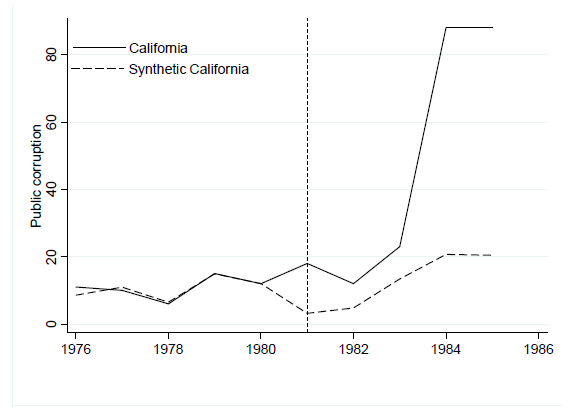 That is the central finding of a study by Alessandro Flamini, Babak Jahanshahi and Kamiar Mohaddes, which analyses the impact of the arrival of crack cocaine in California in the early 1980s on public corruption. They find that public corruption in the state more than tripled in the first three years following crack’s arrival in 1981. The policy implication of their research, to be presented at the Royal Economic Society's annual conference at the University of Warwick in April 2019, is that a strategy to combat corruption should be integrated with a strategy to combat drugs markets. The researchers focus on the crack market in the United States at its origin, an event responsible for a significant increase in drug-related deaths and crime rates in low income and inner city neighbourhoods. Figure 1 provides preliminary evidence of a positive correlation between crack cocaine and various measures of public corruption. Notes: The crack cocaine index is a measure of crack cocaine consumption from Fryer et al. (2013), averaged over all available years: 1980-2000. Public corruption is captured by two alternative measures: (i) the corruption index built by Campante and Do (2014) from an online search in 2009, and (ii) the Boylan and Long (2003) measure of corruption based on a public corruption perception survey of State House reporters in 2003, respectively. Source: Authors calculations. Moving beyond correlation, the study tests whether illegal drugs can cause institutionalised corruption. The findings show that the new drug market caused more than a 300% increase in public corruption in California during the first three years following the arrival of crack in 1981. The researchers argue that illegal drug profits, public corruption and law enforcement co-evolve. This is because drug profits are extremely sensitive to law enforcement, and law enforcement is extremely sensitive to corruption. While inexpensive technology and demand that is sustained by drug addiction lead to huge profits in an environment of weak law enforcement, when law enforcement is rigorous (including aggressive drugs seizures and arrests), profits tend to zero. Furthermore, given the share of profits allocated to corruption (for example, bribing public officials), the larger the profits, the larger the funds allocated to corruption and the less law enforcement. These relationships imply the following process: drug profits increase corruption; corruption in turn decreases law enforcement; which increases profits. Such a process clearly shows that law enforcement, profits and corruption are interlinked (see Figure 2). This process suggests that if a new drug market emerges in a particular state, then corruption in that state should increase too. First, given that it is more cost-effective to produce and easier to develop (compared with, say, cocaine), it is highly profitable for drug dealers and street gangs. Second, unlike cocaine, it is relatively cheap, instantly addictive, making occasional or intermittent use impossible, and with a short lasting but instantaneous and intense high. These features provide a large potential consumer base and create a strong demand sustained by drug addiction. Finally, and most importantly, crack cocaine is key to investigating a causal link from illegal drugs to public corruption. Indeed, its arrival, first in California and then, with lags, in the other US states, makes it possible to use a new econometric approach for testing causality links: the ‘synthetic control method’. The basic relationship investigated here does not depend specifically on crack. It is equally applicable to any other recreational drug that is highly profitable, such as crystal meth, consumption of which has (once again) led to a ‘meth crisis’ in the United States. The contribution of this research lies in showing the existence of a positive causal effect of drug markets on corruption in advanced democracies such as the United States. The results show that public corruption more than tripled in California in the first three years following the arrival of crack cocaine (see Figure 3). Notes: The Synthetic California measure of corruption provides a counterfactual for the hypothetical case in which California did not experience the crack arrival. It was computed with the Synthetic Control Method. This is the first study to examine systematically the causal relationship between drugs and public corruption. The authors believe that it contributes to the current public debate on the design of anti-corruption policies. In particular, establishing the causal effect of drug markets on corruption matters as it signals that a strategy to combat corruption should be integrated with a strategy to combat drugs markets.